With the warm weather finally here, now is the time to make the most out of your free time and your weekends. 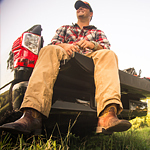 With your new pickup truck from Philpott Pre-Owned Super Center, you can head out and do some tailgating. This is a great way to gather with friends and family, and enjoy the great outdoors without having to spend a ton of money. Let's take a peek at some of the tailgating essentials that you need to have a successful outing! Bring plenty of places to sit down. If you're going to be out for the whole day, you won't want to be standing behind your pickup all day. Invest in some compact, folding lawn chairs. You can also bring some blankets to lay down on the ground nearby. You will have to clean up at the end of the day, so bring along some garbage bags, wipes, etc. A small container of hand soap and a jug of water can help you and your guests keep clean as you handle those burgers and veggies. Don't forget the sunscreen, too! Come to our dealership if you're ready to upgrade your vehicle or get some seasonal maintenance performed.